IT’S GAME TIME! LETS WORK! Stop watching life from the sidelines and get in the game! You may know me as a Penn State All-American or a Cincinnati Bengals and Houston Texans’ football player. I’m also Leah’s dad, sidelining my NFL ambitions to help her ‘beat up cancer.’ But did you know I’m also a motivational and keynote speaker? I share my hard-won leadership and life experiences with businesses, foundations and other groups across the globe. 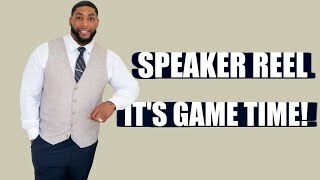 Devon Still’s message resonates throughout the corporate culture: “Winning is a mentality not a skill.” Audiences are captivated as Devon shares his unique leadership experiences from the football field, seamlessly paralleling today’s corporate ‘game day’ dilemmas. Remember the Jerry Sandusky scandal at Penn State University? As captain, Devon led his football family through an unimaginable media firestorm, keeping them focused, motivated, and strong. You’ll want to incorporate his strategies that emphasize manageable goals, teambuilding, self-assessments, resiliency, and determination. Well-respected and lauded for his leadership on and off the field, Devon brings an athlete’s structured mindset to the business community. Forbes magazine touts the benefits athletes offer the corporate environment, and Devon comes ready with a candid conversation fueled by time-tested strategies that work. A page from his personal, oft-used playbook will transform your vision, your leadership style, and your company’s success. Devon Still walks on stage with a life-tested message, “As long as I’m alive, I’m still in the game.” In retrospect, he could have easily been a street casualty consumed by violence and drugs. But he didn’t allow a broken home, brushes with law enforcement, or potentially life-threatening and career-ending football injuries to shatter his dreams. Devon was determined to complete his college education, become a Penn State All-American, and be a top NFL draft pick. Dreams achieved. Devon Still reveals he’s still growing in his faith and spiritual understanding. But Devon doesn’t hesitate to share how spirituality has carried him through life’s tough moments. Throughout professional and personal hardships, Devon prayed for spiritual guidance, but often questioned God’s love and direction. Despite it all, God’s promises prevailed, and with hard work and tenacity, Devon is realizing his dreams. Devon credits his wife, Asha Joyce, with reconnecting him to the church as the all-consuming NFL lifestyle threatened to sideline their personal dreams. Devon and Asha’s spiritual path, including Devon’s baptism two months before Leah’s stage 4 cancer diagnosis, is a heartfelt message of passion, purpose, and perseverance. Devon candidly admits his spiritual struggles are still real, and shows how Proverbs 3:5, “Trust in the Lord with all your heart and lean not on your own understanding” renews his faith. Devon Still’s inner city childhood was riddled with nail-biting, street-side trouble, leading to wayward behavior, school suspensions, and parentaldistress. Devon discusses how football saved his life, opened unparalleled educational opportunities, and expanded his world-view. He embraces being a role model for children around the world. This People Magazine’s 2016 Dad of the Year speaks to how his tumultuous transformative years shaped his personal parenting approach. He emphasizes compassionately connecting with your child, understanding their needs, and creating a loving structure to help them make wise choices. Devon also weaves in the unique challenges of parenting a critically ill child, drawing on firsthand experience after his four-year-old daughter Leah’s unexpected stage 4 cancer diagnosis. He temporarily benched his NFL ambitions to help Leah “beat up cancer” because that’s just what dads do. She’s now in remission.